If there is one thing we diabetics always freak out about – it is over “what to eat?” Sure we know – but right at this moment, when you’re busy with a lot of things, you really don’t want to think about what to eat. You want something and you want it now! 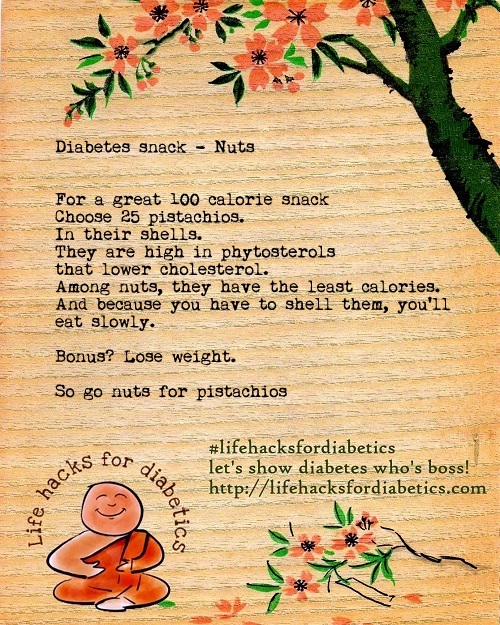 As if that weren’t enough, the snack should be low on calories and high on nutrition. The answer? Nuts. Pistachios in particular. 25 Pistachios in their shells make a great 100 calorie snack. No prep – the best kind. They are high in phytosterols which are good for lowering cholesterol. And among nuts, pistas have the least calories. I recommend grabbing them in their shells because they’ll slow down your eating – help you savor each nut. Bonus? Great for weight loss, too!